What happens to the cars at the end of its life cycles? Sustainability is becoming a top priority across industries everywhere, and car recycling sector is no exception. To tackle the urgent tasks like climate change and carbon dioxide emission, countries around the globe strive to develop more sustainable technology and processes for automobiles – for production as well as for disposal. Every year, Korea produces about 4 million cars, and according to the Korea Auto Dismantlement Recycling Association, about 790,000 cars are disposed every year (as of 2016). The number of cars disposed annually is about 20% of the number produced, which is much lower when compared to the global average. However, such low number can partially be attributed to the fact that Korea exports a significant number of old cars to developing countries. 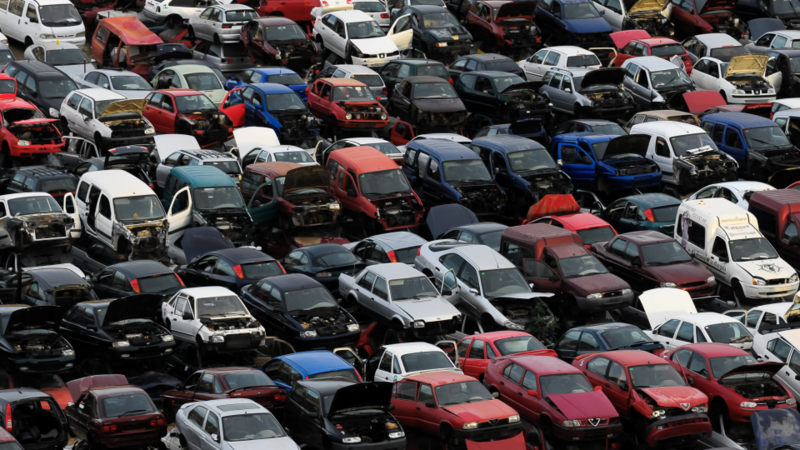 Though the 20% disposal rate seems relatively small, 790,000 cars are no small number. Besides, experts predict this number is likely to go up, along with the increase in the number of cars per each household, which is why it’s important to think of sustainable methods to deal with auto recycling. l How Are Cars Recycled? 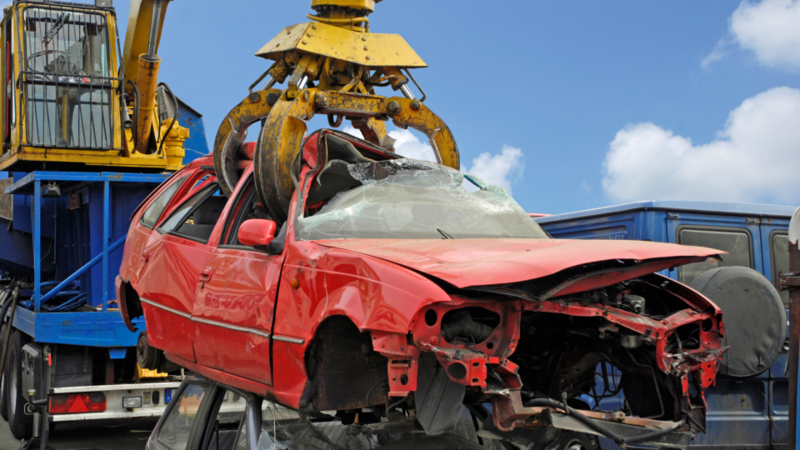 Car recycling is extremely complicated – there are so many parts that go into a vehicle, and proper handling of hazardous materials need to precede before the actual recycling process begins. Complexity notwithstanding, to summarize the process of auto recycling in three simple steps, they are de-pollution, dismantlement, and compression. (1) De-pollution: before the recycling process officially begins, fluids (engine coolant, oil, transmission fluids, gasoline, etc) are drained and removed. Reusable items like batteries, tires, and airbags can also be separated at this stage. (2) Dismantlement: certain high-value parts such as engine, transmissions, alternators, starter motors, and infotainment systems and hazardous materials such as mercury, sodium azide (used in airbags) may be removed. (3) Compression: once end-of-life vehicles undergo de-pollution and dismantlement, the remaining scrap metal is tossed in a vehicle shredder that magnetically separates metal fragments into ferrous and non-ferrous metals. They are crushed flat or cubed and are sold to steel mills for recycling. After further processing (e.g. mixing with other metal components to strengthen them), these scrap metals can eventually end up with auto manufacturers and are used to build new automobile frames. Non-ferrous residues from the compression stage are called ASR (Automobile Shredder Residue), which were typically buried in a landfill. Since the late 1990s however, companies like Toyota Metal are collecting them instead of tossing them out, in an effort to boost recycling rates for these non-ferrous materials. Crushing 10,000 end-of-life vehicles will give out approximately 4,000 tons of steel. Depending on the sophistication of any given recycling technology, products are normally reduced, reused or recycled. A ‘recycling rate’ for end-of-life vehicles typically refers to the total weight of recoverable weight, out of the total weight of a vehicle. According to the American Iron and Steel Institute, the recycling rate for the steel materials in the United States is anywhere between high-80% to low-90%. The recycling rate of steel used in packaging such as cans is around 70%, but the recycling rate for automotive steel reaches upto 100%. 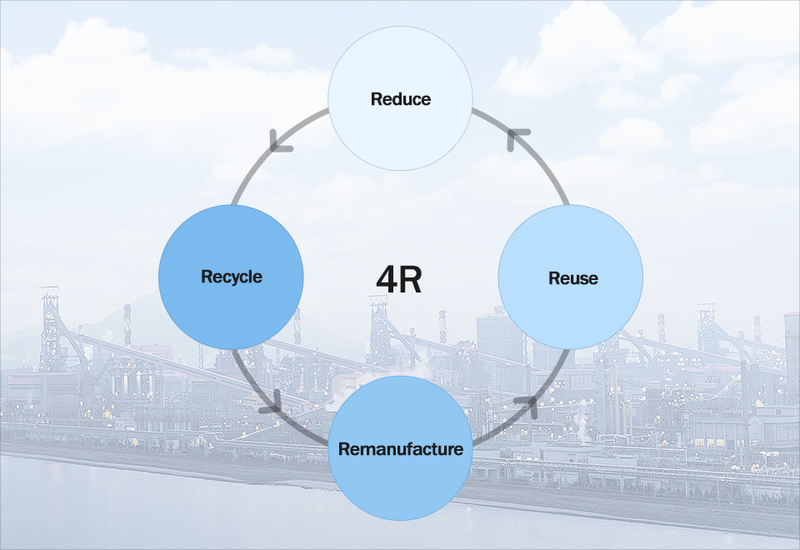 Paradigm is shifting from ‘Produce, Consume, and Discard’ to the circular economy that focuses on 4Rs: Reduce, Reuse, Remanufacture and Recycle. From the perspective of Life Cycle Assessment*, the steel industry is in a good position to contribute to various areas and become part of the solution to environmental problems of many current products and services. *Life Cycle Assessment (LCA) is a technique to assess environmental impacts associated with all the stages of a product’s life from raw material extraction through materials processing, manufacture, distribution, use, repair and maintenance, and disposal or recycling. As noted earlier, automotive steel is recycled almost 100%. As for giga-level automotive steel sheet such as POSCO’s Giga steel, can improve the fuel efficiency by achieving lightweight in the body of vehicles. This can help reduce carbon dioxide emission and enhance the durability of the vehicle when compared to the current products. From an LCA perspective, steel deserves due recognition for its vast recycling scale and its excellence as material. If steel is the most recycled material in the world, the automobile is the most recycled consumer products. Korea, which possesses world-class technology in automobiles and steel products, will hopefully achieve a recycling technology for both steel and automobile that is on par with its top achievements in steel and automobile industries.